The What: Symetrix is using its appearance at Integrated Systems Europe (ISE) to debut a new version of Composer, its configuration software for Radius NX, Edge, Radius, Prism, and Solus NX DSPs. Composer 7.1 for Windows adds support for the Visionary Solutions PacketAV Duet video encoder and decoder, Symetrix T-5 Touchscreen controllers, and PD-1 Telco Dialer. A host of other software improvements makes system design and management more flexible. The What Else: All programming and routing of Visionary Solutions PacketAV Duet video encoders and decoders is now directly integrated within Composer 7.1. In addition, Composer indirectly supports select third-party non-Dante encoders/decoders that use the same control protocol as the Duets. Like Symetrix ARC controllers, the T-5 Touchscreen can control every user-facing function of an installed AV system using Symetrix’s SymVue interface. As with Symetrix DSPs, integrators can now manage any T-5 Touchscreen from Composer, as each device has its own IP address on the network. 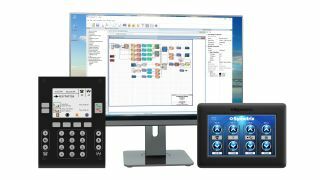 Composer 7.1 also supports the PD-1 Telco Dialer, which lets meeting leaders dial remote attendees into conference calls using a traditional telephone keypad rather than a touchscreen. Composer 7.1 adds several workflow enhancements. Time/date and special character export in the SymVue for Web interface is now present. New sizing handles (horizontal, vertical, and a corner handle for sizing the entire window at once) allow resizing of objects in control screens on the fly. This and expanded design sheet sizes make it easier to optimize installed systems for different remote-control scenarios, including T-5 Touchscreens, smartphones, and tablets. A new crosspoint audio delay is available in the Super Matrix for mono matrix modules. The Site ID field has been increased to 65535 addresses, allowing different groups of DSPs and other devices to coexist on the same network without interfering with each other; two devices in different groups can use the same remote controller number. For diagnostics and system design, Composer 7.1 can now trace signal paths backward and forward simultaneously. Editing of module channel names have been further improved, featuring expanded copy-paste ability. As in previous versions, systems integrators can diagnose any device in a Composer-designed system by simply launching a web browser and entering the device’s IP address. The Bottom Line: All of the above features add up to an expanded universe of use cases for Symetrix networked AV systems and let the installer scale systems to meet clients’ needs quickly and efficiently.